Step 1 Wash the chicken pieces in cold water, pat dry with paper towels and cut the breasts in half so all of the pieces will be of similar size. Sprinkle the chicken with the lemon juice and one-half teaspoon salt. Step 2 Mix the flour, dry mustard, white pepper and remaining 1 1/2 teaspoons salt and put the mixture into a paper bag. Drop the chicken pieces in the bag one by one and shake the bag to dust them. As you remove a piece from the bag, shake it thoroughly to get rid of the excess flour and place the piece on a long strip of wax paper near the stove, where it will be easy to reach when you're frying. Step 3Add the shortening and lard to a heavy cast iron pot with a lid over medium heat. The fat should be about one-fourth inch deep. While it is heating, heat the oven to 250 degrees and put a large shallow baking dish in it. Step 4When the fat is hot but not smoking, add the legs and thighs and cover the pan at once. Turn the heat to low and let the chicken fry, lifting the cover every now and then to check its progress. When the pieces are deep brown on one side, turn them over with tongs and cover the pan again. As each piece of chicken is done (about 14 to 20 minutes, depending on the piece), transfer it to the baking dish in the oven and replace it with an uncooked piece. In Recipes-list.com we have selected the most viewed recipes from category - Main courses Quick and easy . Enjoy the best recipes specially selected for you! 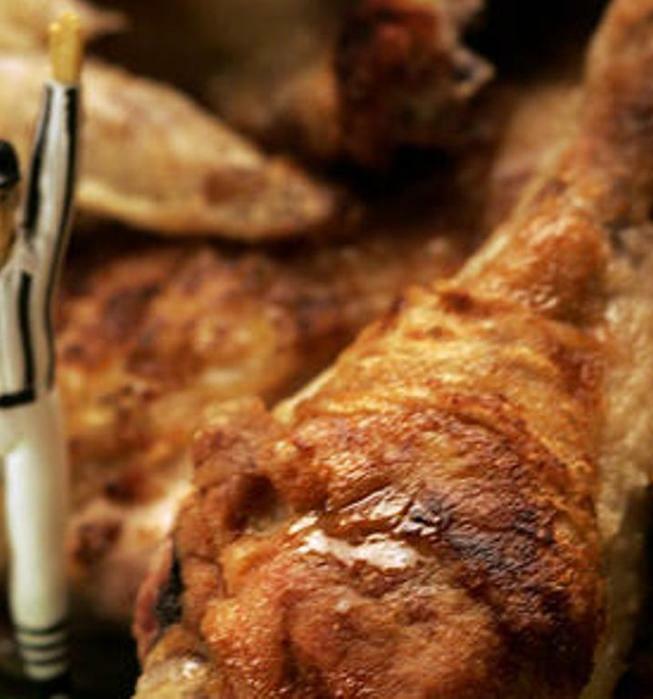 American fried chicken is the right choice that will satisfy all your claims.